Sen. Cory Booker has nothing but respect and admiration for Sen. Rand Paul and his wife, Kelley Paul. He's known the Pauls for years and, though he often disagrees with them on political issues, they've always found ways to do so without being disagreeable with one another. It's important to respectfully lay out the facts and set the record straight regarding an open letter from Kelley Paul to Booker because, frankly, its implications don't add up. In an opinion piece published on CNN on Wednesday, Kelley Paul said Booker should retract a statement she said he made a few months ago: Constituents should not be passive and should instead "get up in the face" of members of Congress. However, taken in context, Booker's comments were, in fact, an appeal for political activism that seeks common ground. If you listen to more than a deceptively edited clip of the speech Paul references, Booker's enduring commitment to decency is clear. He urged members of a nonpartisan, nonprofit organization dedicated to ending homelessness to "get up in the face of some congresspeople and tell them about common sense solutions" that address this problem. Booker also spoke about demonstrating love to fellow countrymen and women later in his remarks. To think Booker is somehow urging violent confrontation with these words requires one to ignore all context. That's why I would encourage anyone to watch the entirety of the senator's remarks. The reality is that Booker has always spoken against needless partisanship and has urged Americans to treat one another with respect when they disagree. 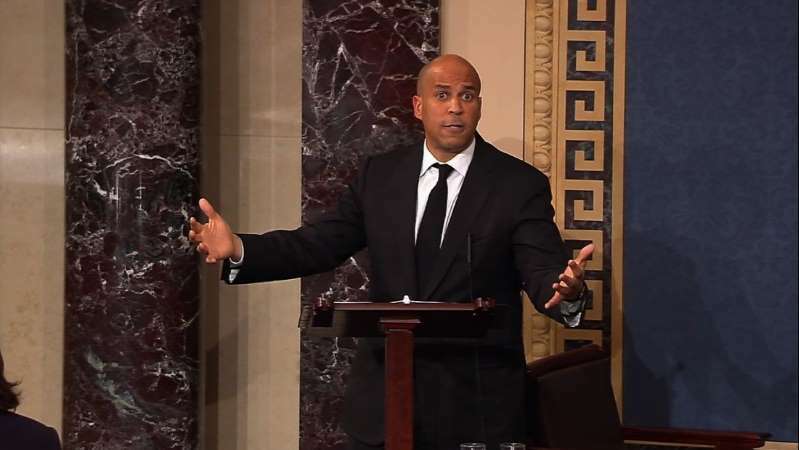 "I subscribe to the idea of radical love," Booker said earlier this summer when asked about calls for people to confront elected representatives. "You should confront evil and injustice, but do it in the ways that Martin Luther King did it ... who always did it by recognizing the dignity of even those who you oppose." Violence against anyone because of their political beliefs is unquestionably wrong and deserves condemnation. The spread of the falsehoods about Booker's remarks this summer came about because of a growing problem in our political system: The vast, hyperpartisan network of publications dedicated to spreading disingenuous and dishonest information about political opponents and presenting it as news. This information is engineered to reinforce our worst preconceptions about one another and drive us further apart. Booker wishes both Rand and Kelley Paul well and looks forward to continuing their work together. Our hope is that this dialogue inspires Americans to take a more critical look at what we read online, look for underlying facts, and find ways to build bridges with others.